While Steeped in Evil is the 15th (!) 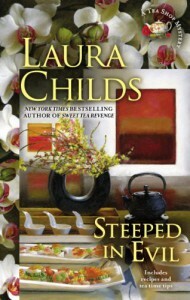 installment of the Tea Shop mysteries, I still found it enjoyable and interesting. It hasn't lost its flair yet, as some long running series tend to do. In this edition, Theo is attending a wine event just outside of Charleston when the adult son of the winery owner is found dead in a barrel of wine. Due to her long history of solving crimes, the owner asks Theo to poke around and try to bring the killer to justice. As usual, Laura Childs is very descriptive in her setting of Charleston and transports the reader to that city in the South. After binge-reading the first several Tea Shop mysteries back in 2012, I actually had to go to Charleston on a trip, so vivid was my image of the place after reading the books. As always, there are several scenes in the tea shop and the descriptions of the tea and food certainly made my stomach rumble. I wish the Indigo Tea Shop existed in real life! The mystery is engaged, well-plotted, and gives the reader a bit of a behind the scenes look into the wine industry. However, I will say that while I wasn't sure, I did guess the identity of the bad guy before he was revealed. I wasn't sure though and it didn't spoil the book for me. Throughout the series Theo has been something of a serial monogamist and I'm starting to see hints that we may see her change love interests again soon. Nothing concrete on that front in this book, but from the hints dropped, I'm anticipating that in a future book. Although this book is #15 in a series it could be read as a stand alone without any background knowledge really necessary, other than knowing that Theo has a rep for solving crimes.